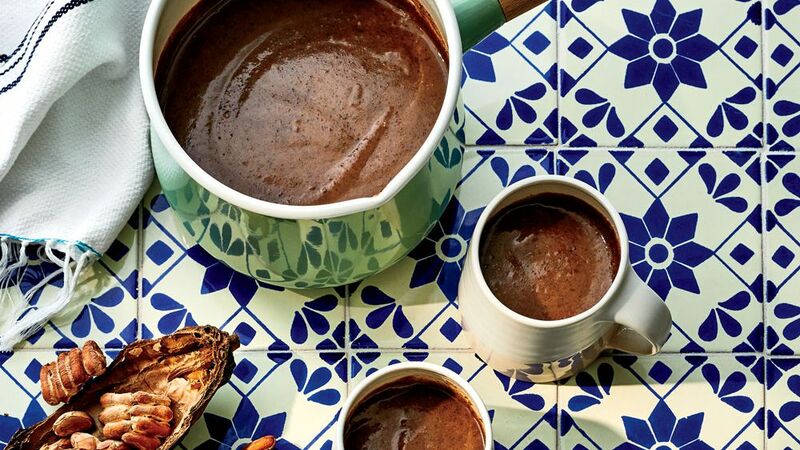 Atole is a pre-Columbian masa-based drink sometimes flavored with chocolate. Eduardo Correa Palacios’ version from Chontalpa gets its chocolate flavor from cacao bean husks, sold as cacao tea at many health food stores, instead of cocoa beans. This drink celebrates the long history of cacao production in the Tabasco region, where it is still popular today for its comforting, rich flavor. Place cacao bean husks in a large enameled Dutch oven. Cook over medium-low, stirring often, until dark brown (not black) and fragrant, about 6 minutes. Transfer to a large plate; spread in an even layer, and let cool, about 15 minutes. Working in batches, grind husks in a spice grinder until husks become a fine powder. Transfer to a small bowl, and set aside. Wipe out Dutch oven with a paper towel. Place masa flour in Dutch oven. Cook over medium, slowly whisking in 2 cups water. Cook, whisking constantly, until smooth. Whisk in remaining 8 1/2 cups water, and bring to a boil over medium-high, whisking bottom and sides of Dutch oven often. Whisk in cacao bean husk powder, sugar, allspice, cinnamon, and, if desired, cayenne. Reduce heat to low, and simmer, whisking often, until mixture is thickened and tastes of chocolate, about 5 minutes. Remove from heat, and whisk in vanilla. Ladle atole into warm cups, and serve warm or hot.